Wow it looks quite good ! I had tried one of the previous versions but there was too much things missing at that time, it was a bit too soon to enjoy the plane, but it was also easy to guess this was going to become something impressive. They are also converting it to P3Dv4 soon, that's good news. Thanks for HU. Previous versions where good I thought but this looks like a significant step forward. Cool! The stores manager is a much needed addition. And the missing station load weights sound like a quick XMLTools fix. 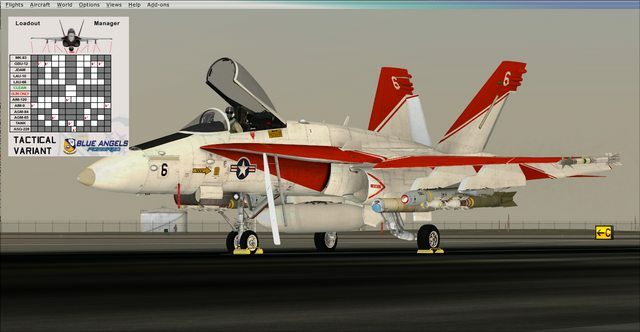 I'm about to fire up FSX just to load this Hornet up. I spoke with Jimi a while back and was tremendously impressed with this project and what he and the others have learned and completed. May just jump on TS and see if the guys are flying too. Been a while since I got in the Sim. should this news be stickified..? I got it and it is excellent..I only like the legacy Hornet so this is a win ! Interesting, I have installed in P3D v4 but didn't notice any flying backwards. Love the Afterburners. Using the gauge restorer in the thread with the download seemed to work quite well also. I am continuing to test but so far it flies very well in P3D v4 for me. I have made several traps on carriers as well. Flying backwards? Hope you get that sorted out. Seems to hang while doing installation. is this for OS 64 bit or 32 bit windows OS? It just hangs at the last line -no restart? It only SEEMS to hang at that step. It LOOKS like it's stopped, and/or locked up. But it's not. Just let it go. Go get a cuppa, step outside for a few, have a ham-n-cheese sammich, whatever. Just leave it alone. It will finish, I promise. It can appear stopped for up to 15 or 20 min, but then it finishes up. This is a well known issue with the auto-installer. It's the Microsoft MSI that installs the required VC Redistributable library. Again, just leave it alone till it's done. If you DL the MSI seperately, and try to install, the exact same thing happens. It looks locked, but it's still working. Would I uninstall the old one before installing this one Pat - or just install over it? 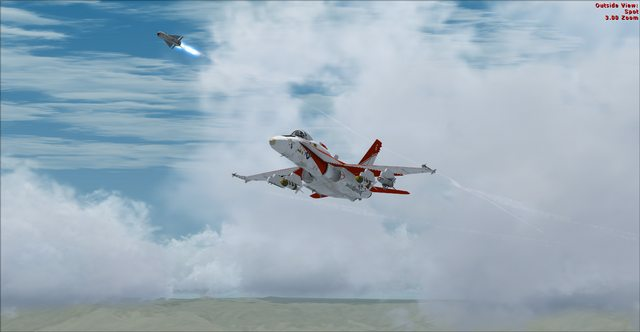 The FMC's is understandably as its calling for the default acceleration Hornets gauge file FA-18.dll which is 32 bit. and I assume that HornetFCS.dll is also 32 bit, there is a file called HornetFCS64.dll in the panel folder that's not used but editing the panel config to use that instead of HornetFCS.dll didn't fix the FSC Fail warning. Recommend removing the previous model completely. As the 2 seater is tied to the older version, I would just remove as well. Got it all installed. Lovely aircraft and love the changes. Can anyone provide a quick HU for this? I got it with the old one as well. I'm running Steve's DX10 Fixer and have converted effects after the install. Black squares around the exhaust smoke. She seem excessively smokey as well. 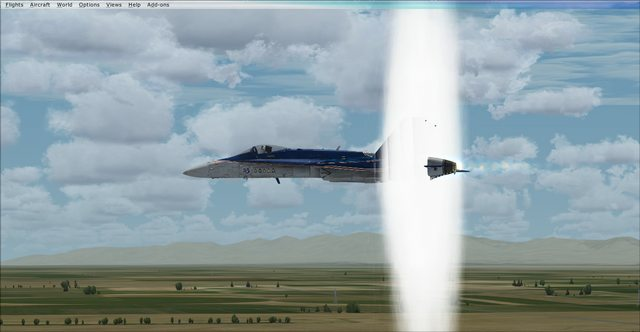 I'll post over on Steve's Avsim support thread but maybe somebody here has already fixed this. Last edited by Ganter; August 28th, 2017 at 09:43. The old one which? The plane or the VC Redist? Actually, either one, just install right over whatever "old one" you mean. I never uninstalled the old redist when installing a new version, and never had any trouble. Same for the plane. ui_variation="NASA Test Plane 852 17.1.30 "
aircraft with speed and superior agility, especially at high angles of attack. 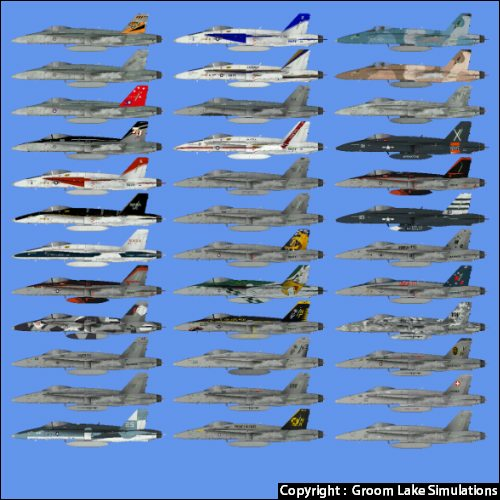 line fighter in several air forces around the world." It takes a bit of copy-n-pasting, but I like to keep some older versions around for various reasons, so it's well worth it. Also, if you choose to keep the old plane installed to compare with, this method will let you know at a glance which one is which, new or old. P3d doesn't come with the FA-18.dll. You need to copy it from an FSX installation to the ...\P3D\Gauges folder. I am pretty sure the HornetFCS64 is included for P3D v4 installations, but I may well be wrong. I'll check with Jimi and Orion (who wrote it anyway). Enjoy all, I sure am! What's the download size for the new package, by the way? I'm on a metered connection here. An can one of the mods maybe edit dmaloof's post? My index finger cramped up trying to scroll past it and the information displayed doesn't contain any indication of a problem anyway. YIKES! My daily allotment is 500 MB. A split into a base pack and a livery collection would be nice, but I guess you can't have everything. It may be possible to pause and resume. The 500 MB are my personal daily "soft" limit, not a hard one set by my provider. I could, in fact, use up all my 15 gigs in a single day, but then I'd be stuck with 1 MBit capped speed (instead of 42 mbit) for the remainder of the month. Absolutely acceptable in 2003, but not 2017 with all the 4k images and HD videos (which I have to avoid like the plague at the moment) across the web. Installed and working fine in FSX, and with Spanish Air Force textures, which is the only one missing operator in the package. Its is great to be able to arm and select weapons in the screen. Can anyone please tell me where I can locate the manual for this bird.